Library image #2681: Aerial view looking south toward unnamed rocks at Tillamook Head in the lower left, and Haystack Rock at Cannon Beach in the distance. The United States Congress designated the Oregon Islands Wilderness (map) in 1970 and it now has a total of 925 acres (925.06 acres, technically). All of this wilderness is located in Oregon and is managed by the Fish and Wildlife Service. A string of 1,854 wave-washed rocks and islands mirror almost the entire length of the Oregon coast from Tillamook Head to the California border. 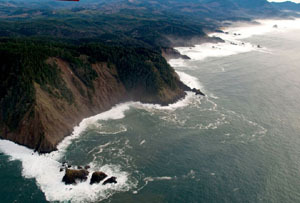 These precious chunks of unsurveyed lands above the line of mean high water, protected as the Oregon Islands National Wilderness, provide a nesting habitat for an estimated 1.2 million seabirds, more than habitat along the coastlines of California and Washington combined. Beginning in April, black-and-white common murres throng the islands. Summer also brings tufted puffins, rhinoceros and Cassin's auklets, pigeon guillemots, Leach's storm-petrels, black oystercatchers, western gulls, and other species, which nest on the islands and feed in the Pacific Ocean. These rocky islands and reefs also serve as haul-outs for seals and sea lions including harbor seals, northern elephant seals, California sea lions, and the Steller sea lion, which haul themselves up on to rocks to give birth, to rest, and to molt. The Rogue and Orford Reef units of this Wilderness constitute the largest breeding and pupping sites for Steller sea lions in U.S. waters south of Alaska. All of the island acreage has been designated Wilderness, with the exception of 1-acre Tillamook Rock and Lighthouse, and all areas are closed to public entry at all times. Waters within 500 feet of the refuge islands are closed to all watercraft from May 1 through September 15. Ten of the National Wilderness Preservation System's 803 wilderness areas are closed to access and use by the general public. Most of these closed areas are managed by the Fish and Wildlife Service. The core mission of the Service's National Wildlife Refuge System is conservation of native fish, wildlife, plants, and their habitats. The Oregon Islands Wilderness, part of the Oregon Islands National Wildlife Refuge, is closed to visitation to protect wildlife and other natural, cultural, and/or other resources consistent with the conservation purpose(s) of the refuge. Wilderness designation provides an additional level of protection for the wilderness portion of this refuge, but does not open the area to public access or use.